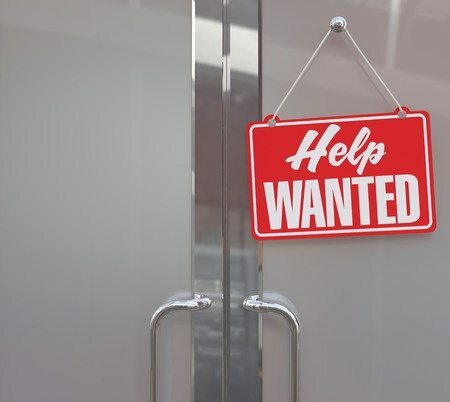 Whether you are looking to expand your small business or are a mom and pop shop looking for help during the busy season, the hiring process can be tough. Start off on the right foot with these great ideas for designing your next hiring sign. Placing the typical red sign in your window that says “Help Wanted” is a quick way to push away the best potential employees. 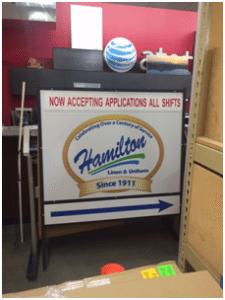 Help wanted signs can lead those who pass by to believe that you are understaffed and in need of saving. They can also makes potential employees wonder if the job is overly difficult or the management is tough to work with. These signs make you think that anyone will be hired – and fast – because other employees have recently quit. Instead of picking up a simple “Help Wanted” sign, design an attractive and custom made sign for your flourishing business. A unique and attractive sign will do wonders for your hiring process by showing potential employees that you are interested and invested in your hiring process for all the right reasons! When creating a personalized hiring sign, highlight the specific position you are hiring for. Are you looking for a new baker for your coffee shop or a hostess at your restaurant? Let the public know exactly who you need! This will help to spread the word about the job position, leading to better and more qualified candidates. Instead of just placing a sign in your window, try more creative locations! Use a sidewalk sign with complementary colors and an eye catching font, or small signs to be placed at your tables or check out. Especially for local businesses, your customers are your best source of information. Loyal customers are a great way to find qualified job candidates through word of mouth! Interested in getting started on your updated “help wanted” sign? Contact Signarama at 303-914-9700 today, or stop in to see us at 1289 South 4th Avenue in Brighton. We look forward to working with you!